A wild Chickadee has appeared! Hey how are ya? It's been awhile, mainly my fault though How's life been? Hey Chickadee, happy late late late Birthday! P.s Would you know SageFire's current username on the fourm. I searched her username but nothing. Happy 0th Anniversary of Me Wishing You 0th Anniversary of Me Wishing... [you know the drift]! Thanks everyone for the birthday wishes! I'm sorry I haven't been around. Things have been a bit busy for me. Hey Chickadee, how you doing? Whats the current status of the next radio-drama? I am wishing to lend my creative juices to whatever stew you may already have. Happy birthday, Chickadee! Hope it was a good one! Hello! I'm Chickadee! Thanks for taking the time to read my page! I'm an undergraduate student who has loved MLP since I was six years old. I am thrilled with the new MLP FiM series for several reasons, including artistic quality, character quality, and its positive impact on a wider audience! While I'm here, its mostly about the ponies and having fun in the community. You'll probably see me popping up in the Role Playing forum, as I love to Role Play and am looking forward to not only talking about ponies, but PLAYING ponies, too! I am also a traditional artist who draws ponies on scrap-paper in classes and uploads them sheepishly with a poor-quality scanner, but I hope to own a tablet one day to make all my art more digitally compatible and gleeful! I look forward to seeing you in the forums and talking to you! If you have any questions, leave me a message! Thank you for the lovely drawing, Cheerilee!! 09:36 PM - Comrade D mentioned Chickadee in post Minecraft Server Version and Plugins. 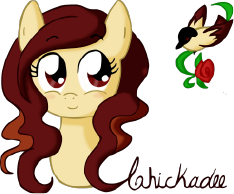 03:38 PM - Sweetiecake mentioned Chickadee in post Bronycon 2013! 02:36 PM - Twilight Sparkle mentioned Chickadee in post Bronycon 2013! 07:24 PM - Lyssea mentioned Chickadee in post Minecraft Ship Building Event. 06:17 PM - Lyssea mentioned Chickadee in post Minecraft Annoucement: Introduction of Skylands! 12:08 PM - Lyssea mentioned Chickadee in post Minecraft Ship Building Event. 11:46 AM - Lyssea mentioned Chickadee in post Minecraft Announcement: Introducing NPCs and starting the process for a new world. 05:02 AM - Flowey! quoted Chickadee in post Twilight at bronycon memes. 12:43 AM - Chickadee quoted Flowey! in post Twilight at bronycon memes. 12:40 AM - Chickadee quoted Kurama-sama in post Twilight at bronycon memes. 01:22 PM - Clover the Clever quoted Chickadee in post No Shave November! 01:57 PM - Chickadee quoted Flip in post No Shave November! 01:56 PM - Chickadee quoted Clover the Clever in post No Shave November! 01:55 PM - Chickadee quoted Whim in post No Shave November! 01:46 AM - Philomena quoted Chickadee in post No Shave November!